If you work at the Suntec / Millenia are in Singapore, you might have noticed this. It must have been there for the longest time! This is Soaring Helix by Philip Johnson. It doesn't look very interesting unless you are a mathematician! Why? 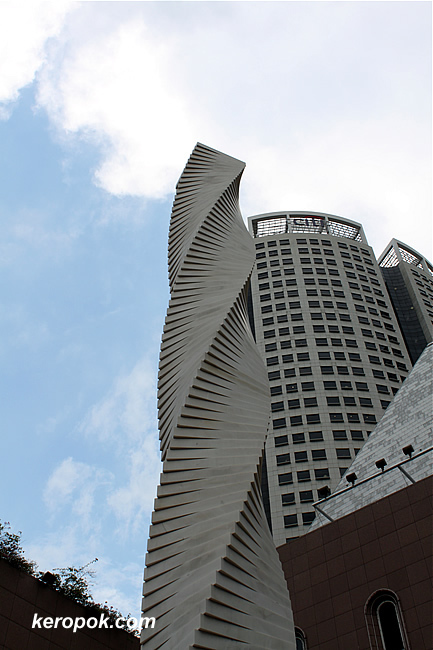 There's this group of Mathematics students in Singapore who are have an interesting page about Mathematics in Architecture! They calculated that the angle rotation of each square is 3.6 degrees. Read what they say about it here. I'm not a mathematician, but I like it! It looks fascinating. Very cool. I like the fact too! Dubai has plans to built a few luxury apartment blocks with a spiral design similar to this. Quite an ambitious undertaking I thought. It's nevertheless a beautiful rotational symmetry tho.